Add a side Caesar, garden salad, crock of soup or Shrimp Skewer for an additional cost. Two grilled garlic-marinated chicken breasts served with roasted garlic mashed potatoes and broccoli sauté. Try it with our NEW Irish Whiskey Glaze! Hand-breaded and served with our Homestyle French fries, kicked-up coleslaw and smoky honey Dijon dressing. Try it with grilled chicken! Voted “Best in Class,” Bennigan’s savory baby back ribs are slow smoked to “fall-off-the-bone” tender. Brushed with zesty BBQ sauce and finished on the grill. Served with Homestyle French fries and kicked-up coleslaw. Tender white fish fillets hand-crafted in delicious beer batter. Lightly fried to crispy and golden brown. Served with Homestyle French fries, kicked-up coleslaw and jalapeño tartar sauce. Simply grilled or Cajun seasoned. Served with herb rice pilaf and broccoli sauté. Try it with our Passion Fruit Glaze! Cajun grilled chicken and shrimp, fettuccine pasta, smoked vegetables and a Cajun cream sauce. Served with toasted garlic bread. 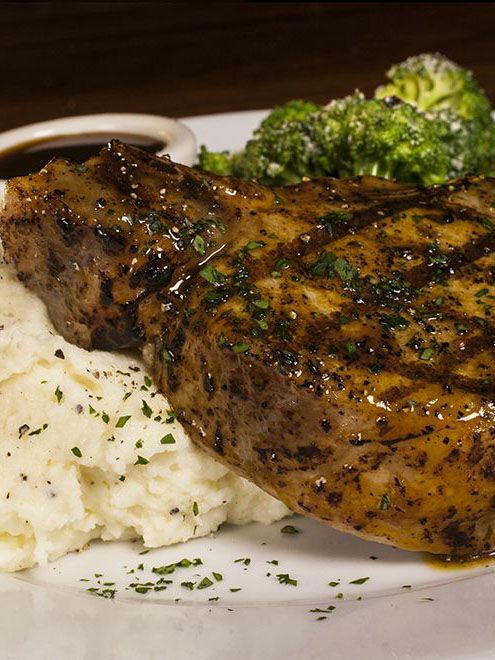 Bone-in, thick cut pork chop seasoned and grilled to perfection. Brushed with our chef inspired passion fruit glaze and served with roasted garlic mashed potatoes and broccoli sauté. Truly one of a kind! Two chicken quarters grilled to perfection, basted and glazed with our housemade Irish whiskey glaze. Served with roasted garlic mashed potatoes and maple roasted brussels sprouts. *Hamburgers and steaks that are served rare or medium-rare may be undercooked and will only be served upon customer request. Consuming undercooked meats, poultry, seafood, shellfish or eggs may increase your risk of food-borne illness.